All necessary features minus the hassle! Hotelier 101 is developed with only small to mid-sized hotels in mind. Its ease of use makes it the perfect choice in the market. No installation required. You can access the system online on any device, anywhere, anytime. Instead of buying licenses, you rent the services at reasonable rates. This way, you also save by not investing in hardware. Our servers are equipped with a high-level security system that automatically backs up all of your information, while software updates occur automatically. Manage all reservations, check-ins, walk-ins, room/time changes, checkout, group reservations and other basic operations easily. Keep track of all current and upcoming accomodations and update reservations through the same interface. Easily set up guest profiles for individuals, companies, agencies and view transaction history. All products and services sold throughout the hotel can be defined in the system and charged as room extras. Get detailed reports that allow you to evaluate business decisions and increase your income. Send automated e-mail and text messages to customers at certain stages. You can receive and manage bookings through your own website with seamless integration. Optionally, you can manage your availabilities and prices at your Internet channels from single application. Easily assign values in multiple currencies for all your products and services. Get payments in multiple currencies. Use daily exchange rates. You can now use the system in English, Greek, Portuguese, Serbian or Turkish. Other language options will be available soon. Users can be assigned different roles. This limits the authority of the users, who can access the system. Easily access history of all user activities. To increase ease of use, we provide access to video tutorials on any related page. Thanks to the "Responsive" design, the system is compatible with all devices with browsers. We use best practices to protect our system and secure transactions with SSL technology. System automatically backs up all data. We offer seamless integration with 3rd party systems such as PoS systems, Back Office systems, Mobile Hotspots. 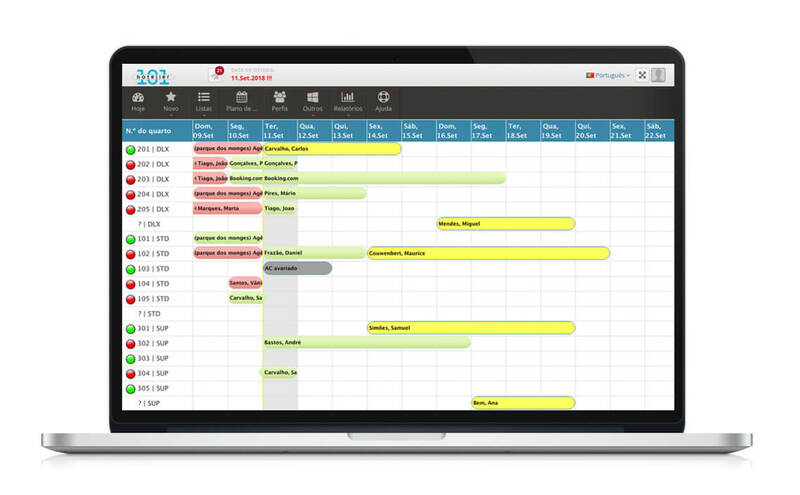 Dynamic Room Plan screen lets you manage operations with ease. You can keep track of all current and upcoming accommodations, update housekeeping status and manage reservations through the same interface. To add a new reservation, hold and drag your mouse along the desired check-in and check-out dates to access the New Reservation screen. To change the room number of a reservation, drag and drop a reservation bar to the row next to a new room number. To extend the check-out date, hold and drag the right-hand tip of a reservation bar to match the desired amount of extended nights. Chart displayed at the center of the screen displays the numbers of all the occupied, available and out-of-service rooms for the given and following 7 days. Just below the chart, under the ‘Arrivals’ section, you can see all the reservations that have arrived or are expected to arrive today. All the reservations currently staying at the hotel are listed under ‘Stayovers’, while the ‘Departures’ section allows you to see all the reservations that have departed or are expected to depart today. add Channel Manager for $30/m. Start 15 day Free Trial! add Channel Manager for $40/m. add Channel Manager for $50/m. add Channel Manager for $60/m. Save money by temporarily suspending your service by paying per-month holding fee. SaaS Hotel Management Information Systems deals in hotel and hotel-sector related software solutions. As its name would suggest, SaaS specifically focuses on offering cloud-based products. Cloud computing, the latest trend in software delivery, enables the users of a system to access it online on any device, anywhere, anytime. Hotelier101, the primary service of SaaS, is a property management system developed considering the needs of small to mid-size hotels. Through its solution providers, SaaS offers integrated solutions such as Restaurant PoS system, HotSpot service, BackOffice System, Channel Manager as well. 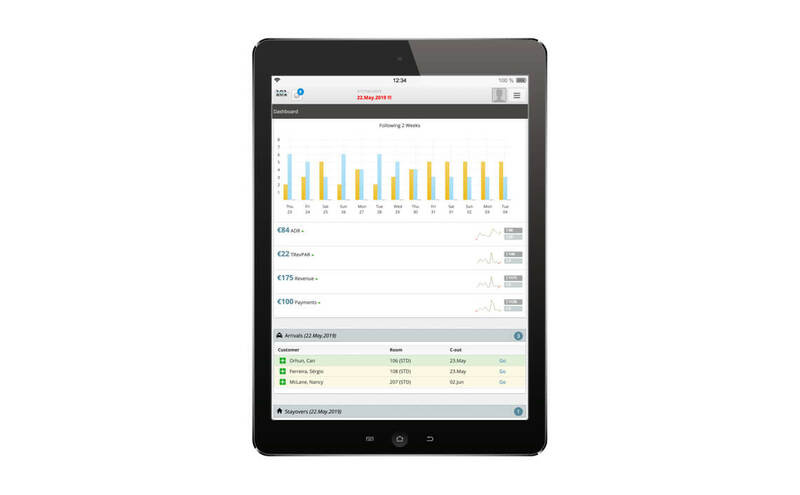 With the easy-to-use interface and a high level of support, it is essential for any boutique hotel. I highly recommended it. Using the software since 2015 and we're delighted with it. Saves us a great deal of time in managing our hotel. Whenever we have a question or need support, they are ready to act. In addition to its unrivaled usability and functionality, Hotelier101 provides excellent support which is the most exciting aspect of the whole service. With 15-day free trial, you can discover the benefits of out hotel management system on your own. No credit card necessary. If satisfied, start your membership according to your payment preference. If not satisfied, terminate membership without any charges. The system is developed solely according to the needs of small, boutique, and mid-size hotels. That's why it's so easy to use. Thanks to HTML5, the system performs much faster than legacy systems. Our servers are equipped with a high-level security system. The system does not need any installation as Hotelier 101 is completely cloud-based. Access the system online on any device, anywhere, anytime through a browser. The system allows you to easily manage your hotel so you can have more time to satisfy your guests. You can also get detailed reports that allow you to evaluate business decisions and increase your income.